as People are the most important thing! Welcome to the website of Ivor Jones, Maori Career Practitioner based in the Eastern Bay of Plenty, New Zealand. My passion is to help you and your whanau to connect with your future career pathways! I am a full time working Dad to a beautiful daughter, and sons, son to a precious Mum and Husband to a loved Wife. I have worked in the New Zealand Tertiary Education sector for over 10 years and I have worked as a career consultant from 2008 – 2012 for Careers New Zealand. I established He Tangata Career Consultancy as the result of what I saw to be a dire need for People to connect with their Future Pathways. I have a Bachelor of Social Sciences (Psychology) from Waikato University and am a Member of the New Zealand Association of Positive Psychology. My practice draws on principles and techniques from a number of career and counselling theories, to acknowledge the uniqueness of each individual. I am Director of He Tangata Digital Media, as-well as serve my Whanau on three Maori Land Trusts. Ivor working with folks interested in achieving their aspirations. 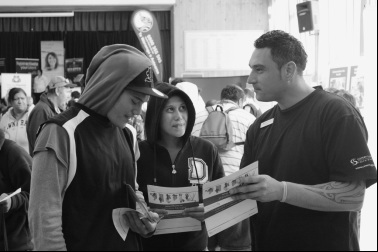 All Māori whānau have career aspirations for their children – irrespective of the nature of the whānau, parents of tamariki and rangatahi will strive to assist and encourage their offspring to make positive career decisions. Ivor covers the wider Bay of Plenty and can travel to you!